NATO Secretary General Jaap de Hoop Scheffer claimed in London that neither Ukraine nor Georgia were ready to join NATO. The official expressed his opinion during his last visit to the capital of Great Britain as the chairman of the alliance. He resigns on August 1st after five and a half years. Every European country has a right to turn to the Alliance with a request of admission, but their wish does not mean that the answer from NATO will be positive. Any country willing to join NATO must meet quite a number of requirements, Jaap de Hoop Scheffer underlined. “Neither Ukraine, nor Georgia today are ready to join NATO,” Hoop Scheffer said, since the political situation in Ukraine is “complicated,” and in Georgia it is “also difficult.” Nevertheless, there are agreements between NATO and these two countries that imply annual agreements aimed to determine the degree of mutual cooperation, the Secretary General mentioned. The Alliance's Secretary General also noted that NATO needs a new development strategy. The Alliance should extend its sphere of activities not to be limited to its military functions. “We are trying to develop a 21st century Alliance, but we do so with a 20th century mindset,” Hoop Scheffer claimed. The official proposed to formulate a new strategic concept to comply with current challenges. Hoop Scheffer recommended one should pay more attention to such threats as cyber attacks, disruptions in the energy supply and security implications of climate change. The Secretary General stressed that the reformation would prevent NATO from turning into a global defense organization. By Mr. Scheffer’s opinion, one of the first priority goals of the alliance is to resume normal relationships with Russia. Russia and the USA have recently agreed to resume their military relationship, which were frozen after the Russia-Georgia military conflict in August 2008. 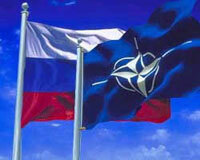 “NATO cannot do without Russia, and Russia cannot do without NATO,” NATO Secretary General claimed.